This healthy and hearty soup, combining nine different types of dried beans with barley, is pure comfort-food that will warm the body and the soul. The recipe calls for navy, lima, black, kidney, lentils, pinto, garbanzo, split peas, and pigeon peas, but if you prefer certain beans over others, omit the ones you don't like and replace them with your favorites. This recipe is easily increased and perfect for a crowd, potluck, church supper, or tailgate event. To make this a complete meal, add hot crusty bread and a leafy green side salad. 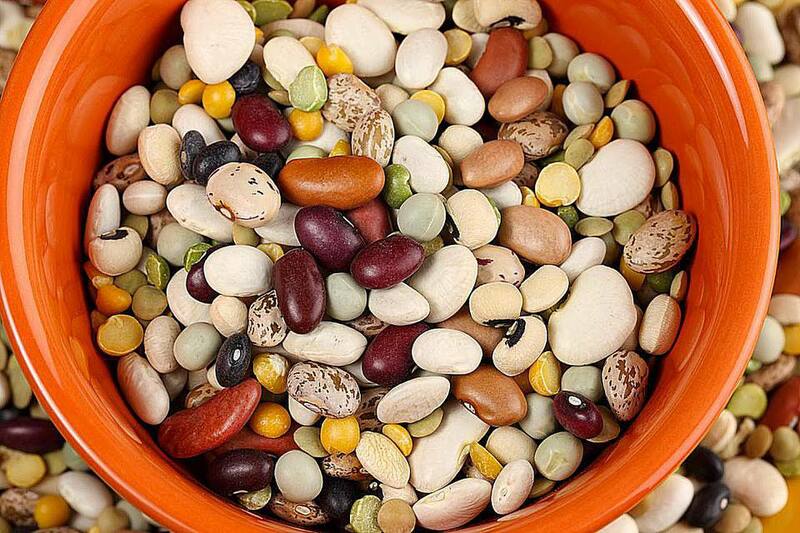 Soak the navy beans, white lima beans, black beans, kidney beans, lentils, pinto beans, garbanzo beans, green split peas, pigeon peas, and barley in a large pot with water to cover overnight. When ready to cook, drain the beans and barley well. Place them in a large stockpot along with the 2 quarts of water, and add the turkey leg and scraps. Bring to a boil, lower the heat, and skim off any foam that rises to the surface. Cover and simmer for 2 hours. Add tomatoes, onion, lemon juice, chili powder, thyme, and sage. Simmer an additional 30 minutes. Stir in the salt, if using, and pasta. Cook an additional 15 minutes until the pasta is done and the beans are tender. If the soup is too thick, add additional water. Remove the turkey leg, de-bone the meat, chop, and return to the soup. Friends and family will appreciate having the beginnings of this delicious soup at the ready when they crave something warm and satisfying. Get yourself a few cute jars and include the recipe instructions on an attached card. Quadruple the bean, peas, and barley proportions to make enough for 9 (1-pint) gift jars, each of which will make enough soup for 8 people. First, pour​ dried navy beans, lima beans, black beans, kidney beans, lentils, pinto beans, garbanzo beans, split peas, pigeon peas, and barley into a very large bowl. Stir to combine. Then line up 9 (1-pint) canning jars. Divide the beans evenly among the containers, stirring the bowl often to keep the beans well-distributed as you fill the jars. Seal the containers tightly with lids and screw-on bands. Print or write out the recipe instructions, beginning the ingredient list with "2 quarts water." Attach to the jar with a pretty ribbon or raffia.